All this in a time where the rents are rising and more and more people complain how difficult it got to find housing in Berlin. And I will not lie, it definitely became harder to find cheap and good places. But here are some tips how you can vastly increase your odds. I implemented all four of them. 1. Go to the big companies. Maybe until now you were looking mostly on the internet, and then going to crowded viewings of mediocre, overpriced flats with 20 applicants. Instead, I recommend to check out apartments of the big housing companies and cooperatives, see the list below. They dispose usually a big number of flats. For instance, my flat belongs to Howoge, and back in 2015 I found it by going to one of their offices and asking in person. Once I sat in front of the employee, she thoroughly looked into their internal database. The flat I left with was one that was still occupied on paper but the current tenant wanted to leave as soon as possible – so in fact I got it immediately, as I wanted. But because I was there so early, I had no competition when applying. on Immobilienscout24* (short: Immoscout). This is the most popular platform for housing in Germany, and as you can see, many of the companies use it to present their offers as well. On Immoscout, you can also create your own account and save a search with your parameters*, and then you get immediately notified by email if a new offer matching your search was added to the database. They also have search only for (more expensive) short-term, furnished apartments*. I’ve written a detailed guide with screenshots how to use Immoscout. Summary: Check out offers especially of the bigger companies. If possible go to their office and apply. Be friendly, make the employee wanting to help you. Bring a German speaker if necessary. Maybe you came to Berlin with the vision of living in one of the “great party districts” like Kreuzberg, Mitte, Neukölln, Friedrichshain etc., where all the cool clubs and hipster bars are. And there is nothing wrong with that, it’s just: A lot of other people want the same. So it might be useful to stand out a bit and take a look at some other areas that are usually missed out. My flat for instance is in Lichtenberg, the district east of Friedrichshain. 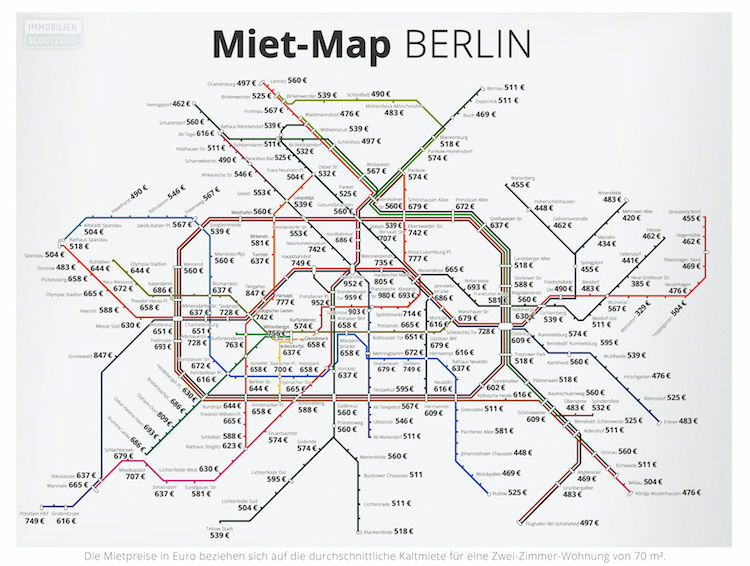 In it’s center, it has a lot of Spätis and take-aways, plus it is well connected to other districts: Every S-Bahn passing Warschauer Straße also passes Ostkreuz 1 and Lichtenberg 3 stops later, the U5 takes you to Friedrichshain in 2-4 stops (with connection to the M10) – and further to Alexanderplatz, where you can jump to the U2 or U8. Basically, from my doorstep I can be in most of these hipster venues within 30 minutes. Maybe you can also find some niches for yourself: Check what locality factors are really important for you and which ones you maybe care less about. Check public transport options – or if you are more into biking: Look at neighbouring areas of your favourite places. For instance, Treptow is next to Neukölln and Kreuzberg, Wedding and Weißensee are next to Prenzlauer Berg. The first one plots the local average price (without heating) of a 2-room flat on all S-Bahn and U-Bahn stops in Berlin. This gives you a good overview for a start. The second interactive map allows you a detailed search for flats of different sizes and plots their prices on a Berlin district map. Summary: Since Berlin’s public transport system is comparably well organized, a lot of seemingly remote districts are not so remote in fact. Besides Lichtenberg, you might also take a closer look at Treptow, Wedding and Moabit for cheaper living. 3. Get all the papers prepared. In other countries, renting a house or a flat might be rather informal: You make a good impression to the landlord, pay the deposit, pay maybe a higher deposit to beat the competition and if they are still skeptical, you offer paying the rent some months in advance. This mostly does not work in Germany. Germans are a nation of renters – house ownership rates are comparably low. And because Germans rent so much and because Germans love rules, renting is pretty regulated. For instance, by law, the deposit cannot be higher than 3 times of the rent. And tenants are very much protected by the law: It is rather difficult for a landlord to expel a tenant, even if they are not paying the rent. As a result, landlords are pretty formal and try to get as much security as possible. Schufa-Auskunft (Schufa information): The Schufa is a central credit bureau in Germany. Basically, they know about your phone contract, your bank accounts and your debts. They know especially about debts that you did not pay back. All this data about you is contained in a Schufa-Auskunft – and as you can guess, German landlords want to see yours. Read here how to get one for free. Mietschuldenfreiheitsbescheinigung (wow, 34 letters! ): This is a confirmation that you have no debts from previous rents, usually issued by your previous landlord. Can be also a simple paper from your parents if this is where you (officially) live at the moment. Einkommensnachweise (proof of income): Ideally, your job payroll of the last 3 months. If you are self-employed, you can find a tax accountant (Steuerberater) writing for you a declaration of your recent income. Your proven income must usually be 3 times higher than the rent, incl. heating (Warmmiete). This is something that German landlords usually take very seriously. If you fail to prove enough income, you can find a third person (friend, relative) giving you a Mietbürgschaft (rent guarantee). Then, this person needs to show their income, and bring their Schufa-Auskunft as well. Copy of your ID card / passport. Yes, it’s trivial, just have the copy prepared. Collecting all these papers may take some time. Therefore, start early. Then, especially if you have competitors, landlords will appreciate that you already have your stuff prepared, and your chances will be higher. Summary: German landlords operate more like authorities than vegetable marketers. Therefore, take the paperwork seriously and get it done in advance. Chances are you’re looking for a cheap flat because you’re poor. In Germany, this can be also an advantage. A lot of housing is subsidised, especially in Berlin. It means that the government in some way gave money to the landlords (for instance, when building or renovating their house), and now they make them rent it out cheaper to poor people. To prove that you’re poor, you need a WBS (Wohnberechtigungsschein – accommodation entitlement certificate). I covered the application for a WBS in an extra article. Just in short: “Poor” is defined for a single person in Berlin as having earned less then 16.800 EUR in the last year, based on your tax bill. Everyone with a legal residence permit for at least 1 year can get a WBS. You can get the necessary forms here. Summary: With a WBS, a whole new housing market will open for you: Quite a lot of cheap flats – even in the famous central districts, can only be given to WBS owners. 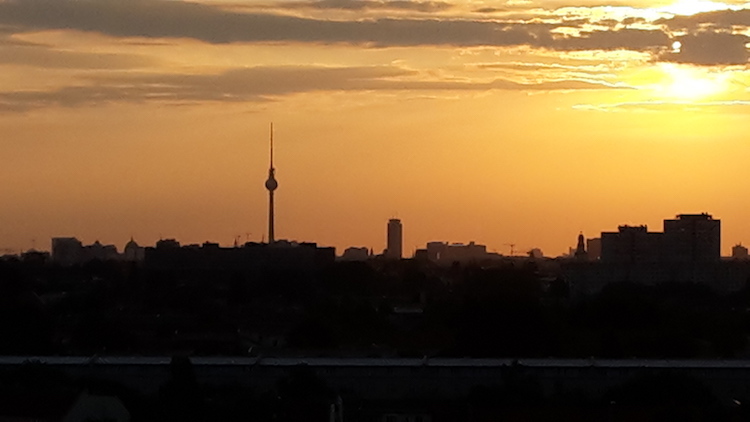 In short: Housing in Berlin is not as cheap as it was 5 or 10 years ago – but it is still one of the cheapest European capitals. And with the 4 tips applied, you will increase your chances to get very good deals. But maybe you know even better tips? If yes, please leave a comment! 2015 Oct 19: For Italian speakers: Berlino Cacio Pepe Magazine and Il Mitte covered these basic tips or parts of them in Italian.